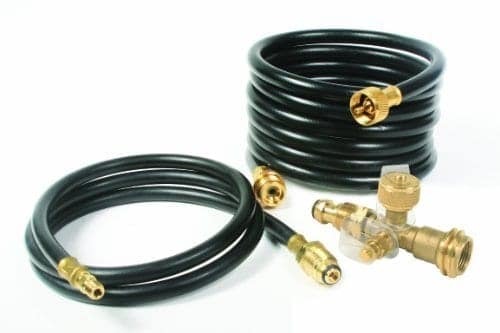 This is an upgraded kit from the Camco 4 Port Propane Tee itself, providing both hoses needed for connecting an external propane tank (5′ hose) and a propane appliance (12′ hose) like your BBQ grill. 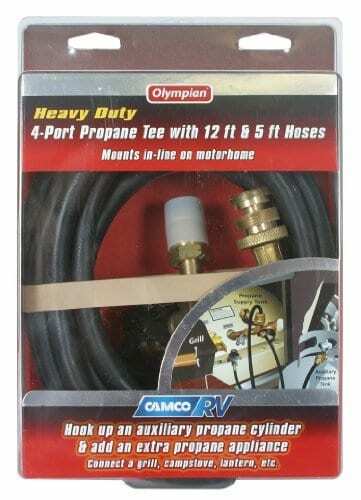 The Camco RV 4-Port Propane Tee mounts in-line between the supply and regulator on a motorhome to allow the connection of an additional propane appliance and the hook-up of an auxiliary propane cylinder. Its ports include a female POL, Excess Flow Soft Nose POL, 1″ – 20 male throwaway cylinder thread and 1/4″ Inverted Flare. The 5′ phone hose has an Excess Flow Soft Nose POL and 1/4″ Inverted Male Flare. 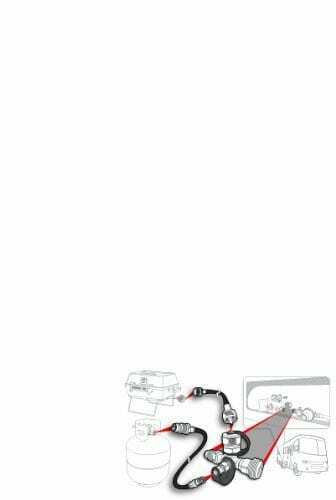 The 12′ propane hose has a 1″ male and 1″ female swivel -20 throwaway cylinder thread.